When rotated at a “magic angle,” graphene sheets can form an insulator or a superconductor. Credit: MIT. Scientists have paradoxically tuned graphene, the so-called ‘wonder material’, to exhibit electrical properties at both extreme ends. According to the findings of researchers at MIT and Harvard University, graphene can operate as an insulator (electrical charge cannot pass through the material) or as a superconductor (electrons can travel through the material without resistance). Since 2004 when graphene was first forged in Manchester, UK, scientists have discovered one astonishing property after the other. It’s the thinnest material known to man, essentially an atom-thick honeycomb sheet of carbon atoms, but also incredibly light and flexible (a 1-square-meter sheet weighs only 0.77 milligrams), while at the same time being hundreds of times stronger than steel. It would take an elephant, balanced on a pencil, to break through a sheet of graphene the thickness of Saran Wrap. Furthermore, graphene is electrically conductive, more so than copper, which is why many look to it as the backbone for the super-electronics of the future. But there’s even more to it than meets the eye. Most recently, researchers at MIT and Harvard published two papers in the journal Nature that show graphene’s far more curious electrical properties. Previously, scientists were able to synthesize graphene superconductors by doping it with inherently superconductive metals. This way, graphene would ‘inherit’ the superconductive properties. Now, researchers led by Pablo Jarillo-Herrero, an associate professor of physics at MIT, found a way to make graphene superconductive on its own. A material’s ability to conduct electrons is characterized by energy bands, with every single band representing the range of energies that electrons can have. Between bands, there is an energy gap, and to leap over this gap once a band is filled to travel to the next band, electrons need extra energy. An insulator is a material in which the last occupied energy band is completely filled with electrons. Conductors, on the other hand, have partially filled energy bands which electrons can occupy to freely move. There is, however, one peculiar class of materials which should conduct electricity, judging from their band structure, but don’t actually do, behaving as insulators instead. These are called Mott insulators. The insulating effect is due to strong electrostatic interactions between the electrons. Jarillo-Herrero and his colleagues experimented with simple stacks of graphene sheets. Eventually, they came across an amazing configuration: two-stack sheet superlattices. Specifically, when rotated at a ‘magic angle’, two stacks sheets of graphene exhibit nonconducting behavior, similar to an exotic class of materials known as Mott insulators. The graphene sheets don’t sit exactly on top of each other but are instead offset by a magic angle of 1.1 degrees. 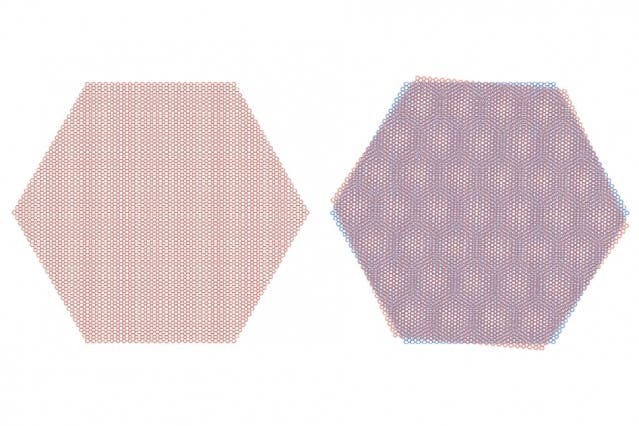 In this configuration, the graphene superlattice exhibits a flat band structure, similar to a Mott insulator, in which all electrons carry the same energy regardless of their momentum. When the researchers then applied voltage, adding small amounts of electrons to the graphene superlattice, they found that, at a certain level, the electrons broke out of the initial insulating state and flowed without resistance, as if through a superconductor. It’s possible, says Jarillo-Herrero, to tune graphene to either behave as an insulator or a superconductor, as well as any phase in between — all very diverse properties in one single device.